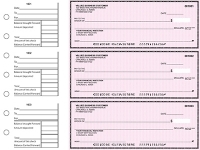 Our pink safety checks are printed on high quality paper and add an elegant style to your checkbook. Looking for cute and feminine safety checks? 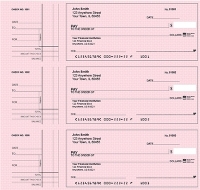 With a light pink background, these personal checks make the payee field very easy to read. 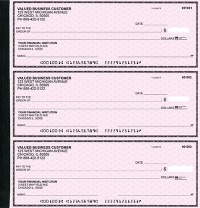 Low cost checks come in single check format or duplicate check format. The top stub check design makes it easier for you to write out your check details in the top register area. Plus, you can find matching pink checkbook covers and address labels. Safety Checks come in a variety of standard colors and all of them have a safety background. If pink is not your style, you may want to check out our yellow safety checks. No matter what color you choose, a safety check is a good choice. Thank you for shopping at Value Checks where you can order bargain checks for less than normal bank prices.